How to apply Alternating Row style while printing SfDataGrid? SfDataGrid allows you to customize the DataGrid while printing, with the help of custom print manager that is derived class from GridPrintManager of SfDataGrid. 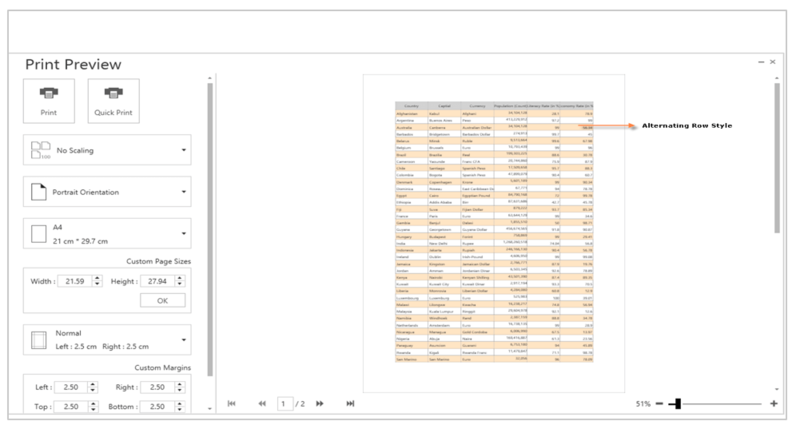 Using custom print manager you can customize the row style, row height, column width, header text, etc. Also you can apply alternating row style by overriding the GetPrintGridCell method in the CustomPrintManager class and set the background to PrintGridCell. The following code example explains you how to create Custom Print Manager Class and override GetPrintGridCell method to apply the alternating row style. You can set the above customized print manager to SfDataGrid.PrintSettings.PrintManagerBase property as illustrated in the following code example. The following screenshot displays the print preview of SfDataGrid with Alternating Row Style.